It’s campaign season. Attack ads, debates, phone calls, stump speeches, fundraisers, and some more attack ads. For many, November 6th means another year of voting for the lesser of two evils. Voting for the lesser of two evils, unfortunately, is still voting for evil – especially when there’s a third option. The Democrats like to pride themselves on their defense of civil liberties, government transparency, and peace, and that’s great. The Republicans pride themselves on cutting taxes, reducing spending, and shrinking the scope of government, and that’s great. But let’s be real here: neither party has lived up to their rhetoric. With congressional approval at historical lows, it’s time to try something else. As the saying goes, insanity is trying the same thing over and over and expecting different results. Instead of comparing and contrasting the platforms of Obama and Romney, I’ll take the far more revealing path of comparing the candidates’ promises to their own records. Candidate Obama promised to close the Guantanamo Bay military prison; to this date, Gitmo is still up and running. Candidate Obama pledged to bring our troops home; President Obama left our troops in Iraq until President Bush’s pre-set deadline. On top of that, his surge in Afghanistan has resulted in 1,000 dead soldiers in the last 27 months, compared to the 1,000 deaths in the first nine years. On government transparency, Obama has targeted suspected leakers with the 1917 Espionage Act twice as much as all previous presidents combined. The former marijuana smoker has conducted over 170 raids on medical marijuana dispensaries, even those in full compliance with their state laws. Obviously, Obama frustrates conservatives. But he’s also clearly let down liberals as well. What about Romney and Ryan? Romney endlessly attacks Obamacare – which is based on his Romneycare. Romney was pro-choice – until it became politically beneficial to be pro-life. Romney flip-flopped on the bailouts as well. Really, there’s not many issues left that the governor hasn’t flip-flopped on. His pick for vice president, Paul Ryan is supposedly a supporter of small government. That would be great if it was true. Unfortunately, Ryan voted for TARP, the auto bailouts, No Child Left Behind, the Medicare prescription drug benefit, the Bush stimulus, the Patriot Act, and both wars. The Romney-Ryan ticket has little to offer those on the left. If we examine their records, it has little to offer the right either. Luckily, there actually is another option. Only one candidate wants to bring our troops home now, close Guantanamo Bay now, lower taxes now, and drastically cut the deficit now. Libertarian nominee and former two-time Governor of New Mexico Gary Johnson is the only candidate proposing a balanced budget. He’s the only candidate advocating the legalization of marijuana. The Libertarian nominee is the only candidate pushing for marriage equality as a constitutional right. He’s the only one wanting to repeal the Patriot Act. And unlike his opponents, he’s got the record to back it up. 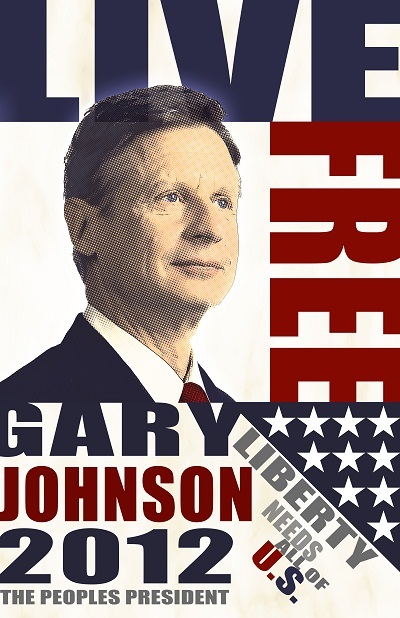 Elected twice as a libertarian Republican governor in a 2-1 Democrat state, he left New Mexico as one of the nation’s four states with a balanced budget. He cut taxes fourteen times, without raising them even once. He’s rated significantly higher than both Obama and Romney on civil liberties by the American Civil Liberties Union. Does Governor Johnson have a chance at winning? Probably not. Does the Libertarian have a chance at drastically changing the nation’s political dialogue? Absolutely. The socially tolerant, fiscally conservative businessman would force the left to protect our civil liberties and promote peace; he would force the right to cut spending and lower taxes. You may not agree with him on everything, but clearly our current politicians aren’t cutting it. Why not give Governor Johnson a chance? This entry was posted in Politics and tagged foreign policy, Gary Johnson, Libertarian, mac, mac mccann, mac mccann tx, macmccanntx, mccann, Mitt Romney, NDAA, Obama, political, politics, Presidential Election, Republican, Romney, texas, ut austin by Mac McCann. Bookmark the permalink.